China's decoupling from America is not occurring by choice and is far from complete or guaranteed to be a success. The fact is China will find it impossible to sell people from undeveloped countries that live in a one room dirt floor shanty anywhere near the amount of goods Americans consume. Many people simply do not understand the illusion that has been created as China over-invested and mis-invested following the crisis of 2008. Like other countries, much of China's growth over the last decade has been constructed upon easy credit and debt, it is important to note that as China's central bank expanded the money supply each stimulus seems to be taking more money to produce the same bump in the economy. A surge in recent exports before the tariffs take effect have masked the dire situation China faces if a solution is not reached soon. Unfortunately, China has no intention of bending or admitting their path is unsustainable. 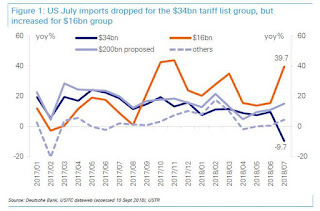 After the US imposed a 25% tariff on $34bn of Chinese goods the chart to the right shows that American imports of these goods fell by 10% year over year during July. It also shows those goods not yet having tariffs applied to them soaring as importers rush to buy before they too become more expensive. This trend is expected to continue and a further drop in August for this group of goods will highlight the difficult situation China faces. We must watch the action of China's government and what is happening to the Chinese currency in order to understand the impact China is about to exert on markets across the globe. As traders returned to work after China's Golden Week holiday they found the latest monetary easing by the People’s Bank of China (PBOC) provided little traction for the market. The PBOC has announced that reserve requirement ratios (RRRs) would be cut by 100 basis points. The injection of cash into the economy, which will be 750bn yuan ($109.2 billion), is an effort to offset the negative impact of higher US tariffs on Chinese exports. The PBOC is expected to cut this benchmark again before year-end amid ongoing stimulus efforts but the markets fell several percentage points anyway. 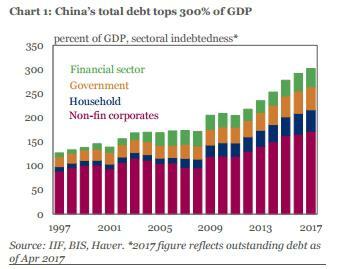 A major problem for China is that it has become addicted to debt and any slowing of the economy will put tremendous pressure on those already having difficulty servicing debt. The latest reserve cut is the fourth by the PBOC this year and comes after Beijing pledged to speed up its plans to invest billions of dollars in infrastructure projects to stop the economy from cooling further. The fact is most Chinese companies fund through bank credit so the stock market in China is not as large a factor in their economy as we might expect. What may be more important is how this plays out in lowering the value of their currency, this is a double-edged sword, it should help exports but at the same time it will make imported raw materials more expensive and may raise the ire of trading partners. Still, more important may be whether a falling yuan causes more wealth to exit China in search of a more stable environment. The fact that the PBOC is already scurrying about in an attempt to mitigate damage flowing from the hard talk being mouthed by the Trump administration is in some ways proof of China's vulnerabilities. While investors assess what continues to lie ahead on the trade front another issue we should not underestimate is that in recent months many of China's woes have been masked by the reality exporters have been loading boats in a rush to ship off extra goods prior to American tariffs going into effect which will subtract from future orders. This could slam demand through the floor going forward as these goods now sitting in inventory work their way through the system. To those investors wishing to brush off the "China effect," the truth is it is affecting other markets and to think the markets that have suffered will suddenly reverse is a bit optimistic. Many emerging markets are highly dependent on selling raw materials to China and those most deeply in debt are feeling the pain of slowing growth. Those looking to Japan and sighting its equity markets as a beacon of hope may be disappointed to find the Japanese central bank has been a big buyer of stocks and responsible for much of their stock markets gains. This has made true price discovery difficult and such actions tends to contaminate markets across the globe when they feedback into other economies. Two basic narratives exist about the escalating trade war with China and one is that China has outgrown its need for America and will simply replace it with other markets. Those talking about how trade wars will hit America harder than China and how Americans will capitulate at the first sign of pain ignore just how dependent China is on exports to America. Still, this view seems to be widely held in Beijing, where the US is seen as so politically divided that when the next recession comes political bickering will tear society apart. The other narrative is that China is on the verge of imploding and that it is a house of cards built on debt. While I tend to lean strongly towards the latter time most likely will be the decider of this debate. Footnote; Private and state-owned Chinese firms act in the interest of the Chinese regime when it comes to foreign investments in the high-tech sectors. Below is the second part of a part-two series which explores why China is on a one-track path that blinds it to other options going forward and why this is a recipe for conflict. What he is saying closely resembles what has happened in the US.Easy cheap money,debt & cost of living et al.The crunch is going to happen to both countries.I would ask who is more likely to weather the storm? A people losing their homes,their 2 1/2 cars,their wide screen TV's etc etc,or a people going back to the basics of family living and self sustainability ?? The US has become a victim if its own success !